Famed for it's stunning beauty, glorious weather, wonderful dining it promises to be a great event. Come for the music, come for the fiesta, come for the history. book your tickets now! They dared to recreate the legends of days gone by, but their courage and dedication has paid off! Letz Zep are proud to announce their inclusion in the Rock Legends Tour 2019. RWP have brought word class productions for the past 30 years and Rock Legends is no different. Three elite bands combine: Letz Zep. The Doors Alive and One Night of Queen, are three of the biggest and most successful tributes on the Planet, bring you songs including 'Whole Lotta Love', 'Riders on the Storm' and 'We Will Rock You' it will be a spectacular evening with some of the best rock songs ever! With an extra night being announced at the Paris Olympia Theatre, the tour is now 21 dates in France, Switzerland and Belgium. Letz Zep are honoured to be invited to headline a concert in Redditch on Sept 22 celebrating the life and legacy of the great John Henry Bonham. 2018 is not only the 50th anniversary of he formation of Led Zeppelin, but also the 70th birthday of John Bonham. The John Bonham - A Celebration Concert coincides with the unveiling of a bronze statue to the legendary drummer. This historic concert is made possible by the tireless work of the John Bonham Memorial, Tickets are 25 and all proceeds to to the Teenage Cancer Trust. 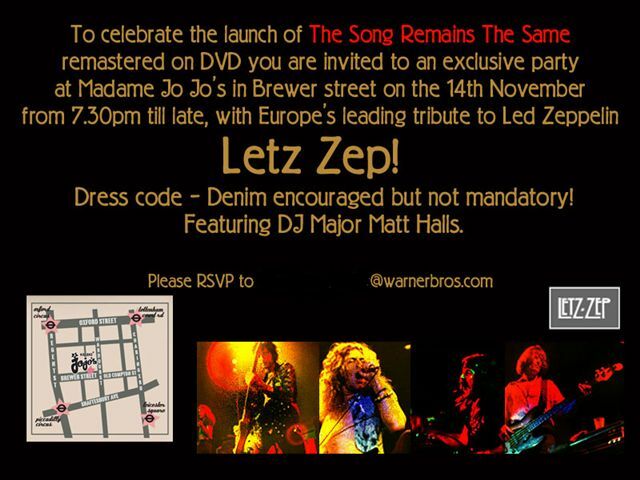 Letz Zep were invited to attend the opening for the Led Zeppelin Celebration Day launch of the DVD recorded at the 02 re-union concert. Both Jimmy Page and Robert Plant have both attended performances by Letz Zep, John Paul Jones also gave the band his kind regards. After Jimmy Page and Robert Plant having both attended performances by Letz Zep, and both giving the band there warmest regards, we are pleased to announce that Letz Zep have been personally invited to perform at the official launch party for 'Mothership' - The new Led Zeppelin double CD as well as the newly remastered 'The Song Remains the Same' Motion Picture. Warner Music Ltd, wanted the very best of tribute bands for this prestigious event, and have named Letz Zep as 'Europe's best tribute act to Led Zeppelin' and they should know, being the record lable for Led Zeppelin themselves!! This prestigious event takes place in Soho, London on November 14th and is strictly by invite only. It promises to be a fantastic night, we look forward to it very much.